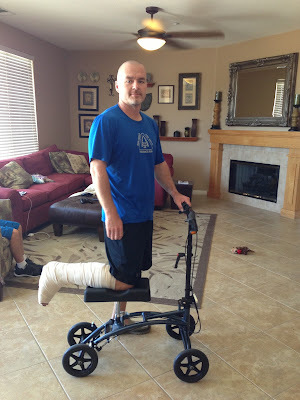 I thought I would write about my recent injury to let people know what happened. I have spoken to many people in person and communicated over Facebook that I injured my ankle and was going to need surgery. I was overwhelmed by the support and positive thoughts. I will certainly look back on them throughout my lengthy recovery process. There have been a few people who have said that I was going to get hurt eventually if I kept running these ultra marathons. Actually, if I had just stuck to running, I would still be running today and never have needed this surgery. Against my wife's better judgement, I decided to play on an adult arena soccer team. It was in January during a game where the initial injury occurred. I went to make a cut and my foot stayed place and the rest of my body twisted in the direction I was going. 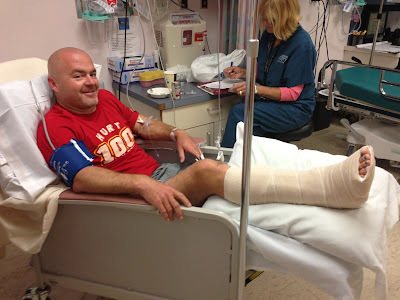 So I didn't roll my ankle, it was more of a twisting injury. I could tell immediately that something was wrong. 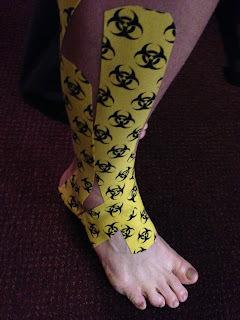 As the days went on, my ankle was very sore and it felt like it was jammed. I started seeing Dr Corey Lichtman, a chiropractor who works with the San Diego Sockers (a professional indoor soccer team). When I saw him I was a little stubborn and explained what happened and told him that I was hoping he could fix me to run in my next 100 mile race in a week. He did the best he could and thankfully didn't tell me to stop running. He advised me that I did need rest but he knew I was going to run no matter what. So before the next race in February, Dr Corey taped up my ankle with RockTape and I ended up setting a PR of 20:58:00 in the Rohring Round the Clock 100 mile race. Overall he did a great job treating me and continues to help me out in my recovery. My ankle was sore after the race, so decided to take it easy, icing it as much as I could and running when things felt good. I proceeded to run two more 100 mile races under 24 hours: Beyond the Limits 100 in March and Umstead 100 in April. Umstead was in early April and my ankle was pretty sore afterwards so I didn't run very much for the remainder of the month. I think I was averaging around 30 miles each week. I started to incorporate more biking because there were times it just was too uncomfortable to run. Then in early May I went out to run the PCT50. I was unsure about this race as it was the first trail race I was going to run since my ankle was hurt. Unfortunately, I had a problem early on. Around mile 2, moving out of the way to let someone go by on the trail, I rolled my ankle. I knew it was bad, as I felt a snap or pop and it hurt immediately to walk and run. I made it through the next four miles to the first aid station and wisely dropped from the race. At this point, it hurt to even walk. I had a noticeable limp all the time. A week went by before I started going to a recommended Physical Therapist and finally got x-rays. The x-rays were fine. The doctor didn't see anything wrong. So I just kept going to the PT sessions that were 2-3 times a week so I could recover quickly: Western States and Badwater were on my mind. This was going to be my first year running Western States and the fourth year in a row running Badwater. Nearly 4 weeks passed with no improvement at all. 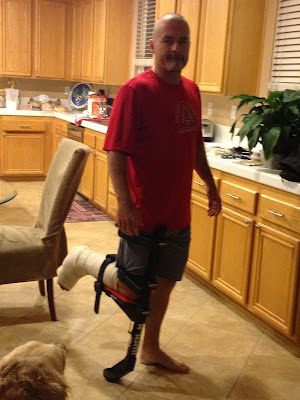 This is when I went to see Dr Garrett Tallman, a recommended ankle and foot specialist to get an MRI. The MRI results were not good. The results were a 5cm longitudinal split tear of the peroneus brevis tendon and a 1cm osteocontral lesion of the medial talar dome. Basically I had tendon damage and damaged the cartilage in my joint. I researched these injuries, and surgery seemed to be the only option. When I went to the doctor for his interpretation, surgery was the recommendation. I didn't hesitate to agree, because the sooner I got the surgery, the sooner I could get on with the recovery. The surgery overall went well. The doctor and his staff took great care of me. They did however find that the damage was worse than they expected from the MRI. The tendon was not just split, it was also ruptured completely. The cartilage had come completely detached and was floating around. The surgery took closer to 3 hours than the originally planned 2 hours. My conclusion is that the injuries were a result of the combination of events from January to May. The long distances didn't cause the injury but they didn't help either. It is my assumption that the initial injury was worse than I thought it was. 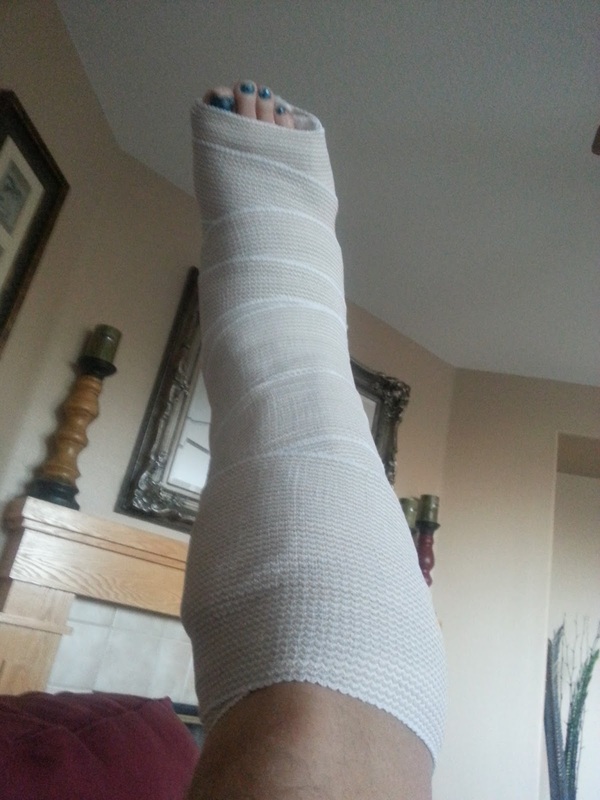 I think I could have split the tendon then and continued to weaken the ankle area. Then the last race I believe I actually ruptured it. The surgeon's plan is 2 weeks in a surgical splint, followed by 6 weeks in a fiberglass cast, and then 4 weeks in a boot before starting physical therapy. The initial 6-8 weeks would be no weight-bearing at all. Danika will be my chauffeur, nurse, and waitress. My plan is to take the rest of 2013 off, and pray for a 2014 comeback.